When I collected the recent pictures of the flowers around the outside of the house, I felt like someone something was being left out. Hence, you not only got the Eagle soaring in the above collection, but you're also getting "Alva"....a series of photos as to how "the old girl" progresses once she's out of the closet. Digging to the back of the closet, I removed the two elongated planters and set them on a table which gets Eastern sun. That was April 10th. As you can see, she still looked pretty pathetic on 4/21/16, although she is beginning to respond to life around her. These were taken almost two weeks after she came out of hiding. She'd been out, exposed to light and had been watered slightly for a few weeks. This is what Alva looked like on 5/4/16...two pots that were put away...in the dark... in the cardboard box...in the closet....back in November 2015. She seems to really be enjoying her routine of weekly watering and daily sunshine. Just a refresher or perhaps an intro for some of you readers. I received Alva (aka "the old girl") when we lived in Virginia. A gift from friends (Joyce & Bill) when they came to a cookout at our "Home in the Hollow" in 2006, she has been with me ever since. I have no idea what kind of plant she is and neither did Joyce. A plant that once belonged to her Aunt Alva, given to her mother, then passed on to Joyce, "the old girl" is put in a cardboard box and placed in the dark closet in November and remains there until the Spring when she, once again, emerges and becomes a beautiful flowering houseplant. Never give up on Nature. Hello, welcome back Alva! She is looking good! Happy Monday, enjoy your new week! That collage is gorgeous. Love the 'old girl'. Not sure what it is and don't think I have ever seen a plant like it-especially that hibernates during the winter and looks to be dead...lol..the rejoins the land of the living. 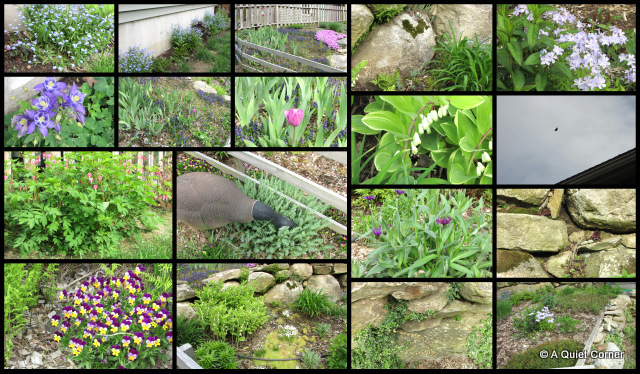 Delightful post about the 'old girl' and beautiful montage of photos of your yard ~ gorgeous! ooooh what a very special plant!! i enjoyed all your beautiful images!!!! I name plants after people too! Welcome back Alva! Enjoy the summer..